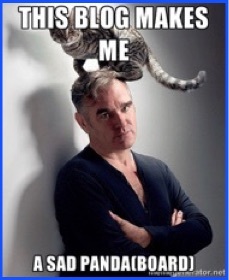 This is Morrissey. He is not a developer and has nothing to do with this blog aside from I happen to be listening to The Smiths as I wrote this. Turning on an LED is the hello world of embedded programming. Except its better. Unlike hello world where there is usually a million things standing between you and the hardware, this is more immediate. It feels more real. You are directly making it happen rather than calling some mystery function in some mystery standard library calling some mystery system calls in a mystery OS that does who-knows-how-much work to make your text appear on screen. It also happens to be a great way to initially debug things on a system with no debugger (yet) and no way of knowing where and why the CPU died running your code. So with that purpose in mind, lets go. So if we want to set something for pin 47, then 0x3F200010 seems to be the place. That register starts with pin 40, we want 47, and each pin is 3 bits, so the bits we care about are 21, 22, and 23. So lets go ahead and set it to 0b001, meaning output. // loads the physical address of the GPIO region into r0. // we want pin 47. 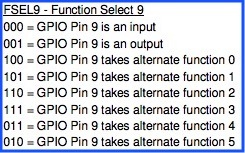 Every word contains 3 bits per pin * 10 pins. 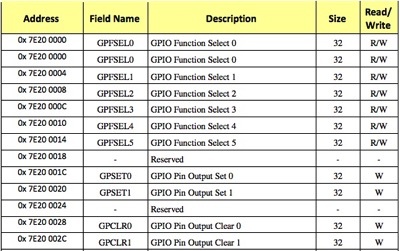 Ignore the fact that I am zeroing out all the other GPIO pins for the moment. Now all we need to do is drive the pin high. Interestingly, there are two different registers for driving a pin high and pulling it low. Its not just a matter of writing a one or zero to the same place. To drive the pin high and turn on the light, write to GPIO base address + 32. To pull it low, all we'd have to do is write the same value to GPIO base address + 44. // Drive GPIO 47 to high, causing the LED to turn on. Great, you have a light on now, but how can we use that to debug? For example, we can flash it a different number of times depending on where we get. If you make it past point A, flash once. If you make it past point B, flash twice. If some value is greater than the expected max, flash it three times. Its not perfect but it is a start.